With melodies and harmonies that evoke those of America, The Byrds and early CS&N, the Kentucky-bred duo of Ken Marvin and Brian Gentry show off their very own skills crafting listener-hooking turns of phrase and choruses one is singing along with on the second go-round. Airplay-worthy tracks abound including “Wishful Thinking”, “Without You” and “Great Divide”. Production is first rate. I've been a follower of the music Ken Marvin and Brian Gentry since their debut album "Safe Harbour" many years ago, and have long appreciated the maturation of their work both musically and lyrically with each passing record. But with the Americana-infused "Songs from Gholson Road," this duo has taken it to a new level. Songs like "Pieces of Julie," "Wishful Thinking," "Bluebird" and "Thinkin' About You" show an artistry that matches up with just about anything I listened to in the singer-songwriter/folk rock era of yesterday or the Americana scene of today. I highly recommend this album. Marvin and Gentry take runner-up honors for Best Group/Duo at the 2015 11th Annual International Acoustic Music Awards (IAMA) for their song "Wishful Thinking." In addition to the award, the song is featured on a compilation CD with the other winners distributed to Sirius XM and other radio stations and web networks. Ken Marvin is a local musician who has been pumping out tunes for over 40 years. He is a huge classic rock fan but also writes much of the music that his musical duo, Marvin & Gentry, performs. They will be performing on June 22 at Live on the Riverfront. [UPDATE: This performance has been cancelled due to weather. Marvin & Gentry have been rescheduled for July 4] Put your hands together, clap and iMeet Ken Marvin. I hail from just down the road in Mayfield - as does my lifelong music partner, Brian Gentry. Both of my parents were raised in Paducah. I’ve lived in Nashville on/off for many years, but Paducah is just my speed. I have three children, and only one wife. Quite the jokester, right? My lovely wife, Daniela, comes via Austria and Arkansas. She has a broad collection of life experiences. Marvin & Gentry have been “doing” our music since we were about 16-17 years old. I’m 58 years old now - so you can do the math. Like almost every singer/songwriter, we began playing covers of our favorite artists: Beatles, Crosby, Stills, Nash & Young, America. I also loved Motown, and good old classic rock such as Led Zeppelin. But, when it’s just two guys with acoustic guitars, you stick with what you can actually make sound decent. Back in our early days there was no internet. To learn the songs one had to buy the vinyl record and a book with guitar chords. The artists/bands literally published their songbooks! They were very cool - great pictures too. At some point, early on, we decided we could write our own music. Were most of the songs horrible? Probably so, but it was a start. Fast forward to today, and I think we are pretty decent writers. If you’re old enough to remember songs like Horse With No Name and Ventura Highway by the trio AMERICA, our music caught the ear of Dan Peek - an original founder of that group. We did several records with Dan, who sadly passed away about five years ago. For numerous reasons, we weren’t able to take our music on the road to perform. It was a surreal experience - meeting and becoming friends with one of our music heroes. He was a fantastic friend and human being. Yes, June 22. When we play at Paducah Riverfront we will have a great band in tow - guys from Nashville. My partner, Brian, lives just outside of Nashville and we’ve been working with the band for several months. We hope to start booking more dates with the band. We’ll be playing some America/Dan Peek covers, as well as our own music. As we speak, we have sent a batch of our songs to a company that places music for TV/film. We didn’t call them, they found us. That’s a good sign. Did or do you work anywhere else? I’ve had so many different jobs I’ve lost count. I’ve never actually caught chickens for a living, but I have worked beside them. Long story. If one can’t make a living full-time in music, you have to do what it takes to keep the fire burning - so to speak. Where can we catch you guys playing? We’ll be at the Riverfront on June 22nd. Otherwise we do several fly dates with just our guitars - no band. We still get calls from our days on radio with contemporary gospel record label Milk & Honey Records. What bands influenced you when you were growing up? My front license plate reads THE BEATLES. I’ve already mentioned some others. Anything “folk/rock” works for me. Favorite album of all time and why? That’s a tough question. I usually have to go with AMERICA Homecoming. My wife and I are trying to build a house/studio on 10 acres near Paducah airport. That and Netflix keeps us occupied nicely. Now you’re getting into my personal space. But, I already feel comfortable with you. So, it’s simple. Thin crust pepperoni/mushrooms. Favorite season: Summer, Spring, Fall or Winter? Definitely Fall. It signals a time of rest and reflection. What’s better than a cool crisp day with beautiful colors, and the perfect cup of Joe? I also started working with two guys that I had met in Nashville back in the CCM days, Ken Marvin and Brian Gentry. They really, really wanted to form a trio and we did. I called it ‘Peace’ and we made, I think, three albums all together. It was great! It was kind of like Dewey and Gerry only they were Christians. They were both so very talented as songwriters and musicians – even in the production department. There were times that they would bring them to me and go, ‘Do we need to change anything?’ and I’m, like, ‘It’s fine. You don’t need to change a thing. Just slap it on the record and it’s done. It’s ready to go!’ That really, in some ways, filled a void that I felt coming out of the trio experience. It wasn’t that I needed to be. At first, I was relieved to get out of the band. "That was all part of that ‘after America’ experience and one of the more pleasant aspects of the post-America thing was working with Ken and Brian. There’s a lot of music that we made together that I would love to see get out there but it’s such a rat race now. It’s the old joke: How do you make a million dollars in the music business? You start out with two." I contacted Marvin and Gentry after news of Dan’s passing had made the news and asked them for their reflections on their friend. Brian Gentry, speaking for both he and Ken, said, "We met Dan in 1987 and the history of that is recorded in our bio (MarvinandGentry.com). I remained in constant communication with Dan up until his death. Needless to say, was surprised to hear the news. We are all still in shock and trying to come to grips with his passing. "Dan was more than a musical influence and collaborator, he was a great friend. He has been there for me through all my ups and downs and was the kind of friend that I could share my innermost thoughts with. Although we were always talking on the phone and through email, I recently spent a week with him at the Orchard, his home recording studio in Missouri. I was promoting a solo project that Ken produced at the time and was on my way to a gig in St. Louis. Dan and I hung out like old times and had several heart to heart conversations. That visit turned out to be the last time that we shared together. "Our fondest memories will be all the times we spent at The Orchard with Dan and Catherine making the Peace records in the 90's up through the early 2000's. It was a magical time that Ken Marvin and I will always cherish. "Dan was one of the funniest guys I have ever known. He had such a great sense of humor and was always finding a way to lighten things up with his sharp wit. We are so grateful for the years we shared together. He will be deeply missed." The concert, billed as "An Acoustic Evening with Marvin and Gentry" at New Way Church in Hernando on Oct. 10. is set for 7 p.m. with doors opening at 6 p.m. at the church, located at 1471 U.S. Hwy. 51 South in Hernando. The duo "Marvin and Gentry" recorded and performed under a long association with former 1970s supergroup "America" member Dan Peek as the group "PEACE." The same rich harmonies and smooth vocals associated with "America," which topped the charts with such Top 40 hits as "Horse With No Name" and "Sister Golden Hair," accompany Christian Contemporary hits sung by the duo as "Marvin and Gentry." Influenced by such great songwriters as Simon & Garfunkel, Lennon and McCartney, Crosby Stills Nash and certainly Young, the duo of Ken Marvin and Brian Gentry, both from Kentucky, have been writing and recording together since the late 1980’s. While the vocal harmonies and performance style of the duo can be traced to these and other great songsmiths of that era, it is the Christian market where the two realized early commercial success. Influences of Peek and "America" still echo in the lyrics and melodies of their songs. "They (America) had an amazing career and sold millions of records in their 40-plus career," said Gentry, who had just recently arrived back in his home base of Nashville after a concert in California. Four years after his good friend and musical collaborator Dan Peek passed away, Gentry and his musical partner Ken Marvin still tour in their original duo format. "It was a huge loss for me," Gentry said of Peek's untimely death. "Dan and I were really good friends and he was my mentor and collaborator." Yet, it's the pared-down acoustic setting that suits Marvin and Gentry best. "Whether we are playing for people in a tiny coffee house in Green Bay, Wisconsin or a big church such as Willow Creek Church in Chicago, people dig what we do," Gentry said. "We get comparisons to Crosby, Stills Nash and Young and of course, America. Even Simon & Garfunkel. We do find that people of all ages enjoy our music." For more information please call 901-361-3973. Robert Lee Long is Community Editor for the DeSoto Times-Tribune. He may be contacted at rlong@desototimestribune.com or at 662-429-6397, Ext. 252. Brian Gentry may not be a household name in Contemporary Christian Music, but he is certainly no stranger to the scene. In fact, he is likely glad that his notoriety is not based in Contemporary Christian Music (CCM). Influenced by such great songwriters as Simon & Garfunkel, Lennon and McCartney, Crosby Stills Nash and many others, the duo of Ken Marvin and Brian Gentry, both from Kentucky, have been writing and recording together since the late 1980’s. While the vocal harmonies and performance style of the duo can be traced to these and other great songsmiths of that era, it is the Christian market where the two realized early commercial success. Marvin & Gentry plied their songwriting craft with live performances in colleges, churches and other venues across the country in the 1980’s where the duo found acceptance with their melodious style, crisp harmonies and a spirit-filled message to wider audiences. However, it was the discovery by the late Dan Peek of the band, AMERICA, that would lead to a collaboration of the duo’s next four recordings and the formation of the Christian-rock band, called PEACE. In 1989, Dan Peek, along with Marvin & Gentry, produced the duo’s second studio effort called Light of the World. The collaboration continued for another six years as Peek released a trilogy of recordings by PEACE on his new label called 7-Mile Records. The trio of recordings by PEACE stands as great synergy of the talents of Peek, Marvin and Gentry and combine the fresh, refined lyrics of Marvin & Gentry with recollections of the soft rock and pop sound of Peek’s AMERICA. One reviewer said that the three recordings of PEACE are an incredible contribution to the music of the ‘90’s. Ironically, Dan Peek passed away on July 24, 2011, just days before Gentry was scheduled to appear at The Upper Room. Gentry said he was torn about his appearance at The Upper Room because Peek’s funeral was scheduled to be held in Missouri while Gentry was scheduled to be in California. “Dan’s wife Catherine asked me to serve at Dan’s funeral as a pallbearer. When I told her that I had a dilemma because I had been booked at The Upper Room, she told me that Dan always said that ‘life is for the living’ and she insisted that I go because ‘Dan would have wanted it that way’.” said Gentry. Gentry decided to make that Upper Room appearance a tribute to his late friend. At that concert he shared a number of stories from his friendship with Dan Peek and played a number of Peek and America tunes. He recruited the help of the Upper Room’s house band on some of the songs. “We had a great time that night and I realized that I was able to honor Dan in this way. It also gave me a chance to share a part of Dan with the Upper Room audience” said Gentry. In 2010, Gentry stepped out on his own and recorded his first solo album called Dirt for a Crown. This album is a blend of Gentry’s crisp and clean vocals along with 10 original tunes born out of his journey of faith, love, struggle and triumph. The album has received rave review while Gentry has been touring the country promoting it. Gentry is scheduled to appear at The Upper Room (Christian Coffeehouse) in Mission Viejo, California on Saturday, September 15 at 7:30 pm. “This will be Brian’s fourth appearance with us” said Ron Strand, of The Upper Room. “He has appeared twice as a solo act, and once with his musical partner Ken Marvin”. It is always a treat to have Brian join us at the Upper Room”. What I think is most unique about Brian is his ability to relate the most common issues we face as human beings and as Christians in a way that draws you in.” He is a masterful storyteller and a consummate musician” said Strand. Listening to the musical and lyrical artistry of Brian Gentry, whether on a recording like the recently-released “Dirt for a Crown” or in a solo acoustic concert setting, is akin to taking a big gulp of crystalline water on a scorching hot afternoon. It quenches a parched, thirsty soul; radiates faith, hope and love; deals with the challenges of life with a realistic, honest and yet resilient voice. It’s a voice we all need to hear. Touring in support of his first solo recording, a folk-infused, 10-song album reminiscent of the best work of Bruce Cockburn, Brooks Williams and Mark Heard, Gentry was the featured artist at a recent gathering of booksellers and publishers in St. Louis. Booksellers are a beleaguered lot these days – sales declines and challenges from behemoth on-line retailers; considerable uncertainty and not much stability. Gentry was exactly what they needed to hear. It was but one song tailor-made to cure the St. Louis blues. Others, including “This Far,” “Without You” and “Masterplan” similarly touched the nerves of listeners who felt Gentry had walked at least some of the roads that they were on and could serve as a point of light on their path forward. In the closing track on “Dirt for a Crown,” Gentry says that “time flies like a Concorde jet.” And we know it does. If you have a chance to catch a performance by Brian Gentry… do it. Time flies. Don’t miss your chance to be challenged and encouraged. And in the meantime, pick up a copy of the compact disc. Singer/songwriter Brian Gentry is utilizing a different forum to showcase tunes from his new CD Dirt For A Crown. 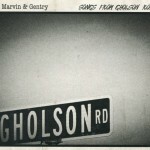 Well known in the Contemporary Christian and gospel music camps through past releases with the group Peace and the duo Marvin & Gentry, he'll be performing songs from the solo work Saturday night in an CD release event at the Salvation Army Berry Street Worship Center, 225 Berry Street (corner of Berry & Meridian Street). It's the latest in a series of events the worship center presents as part of an overall mission of community service and inspiration through non-traditional and more unorthodox spiritual presentations. The duo Marvin & Gentry recorded under a long association with former AMERICA member Dan Peek as the group PEACE. This past decade has seen Ken Marvin and Brian Gentry following a more singer songwriter style. Nashville Recording artist Brian Gentry will perform on Sunday, May 2, at Crossroads Church at 1 p.m. (West Sechelt Elementary School). Brian Gentry of the duo Marvin & Gentry recorded under a long association with former America member Dan Peek's forays into Christian music as the group Peace. This decade has seen Brian Gentry following a more singer/songwriter style. Full Circle - Nashville Band makes its way to Frankfort... Music lovers who are inspired by Simon & Garfunkel, Lennon and McCartney should visit Watershed Cafe on Saturday, March 21 to hear new and old songs from Marvin & Gentry. The duo Ken Marvin and Brian Gentry are making their way to Frankfort from Nashville to share some of their new songs from their new project, "Master Plan." Marvin & Gentry have been in the studio teamed up with Grammy award winning Producer Mitch Dane from Jars of Clay. "I guess you can call us a faith-based folk rock band," said Gentry, who said they have been compared to Simon & Garfunkel. Marvin & Gentry became popular within the Christian market when they formed in 1987, with their albums "Safe Harbour" and "Light of the World." During their seven years as a Christian folk band, they began writing and producing with Dan Peek of the band America. In 1994 they teamed up with Peek to form the group, Peace. "After 20 years, we are back to our roots and have come full circle," Gentry laughed. He said their goal now is to promote their new CD, "Master Plan," by touring different coffeehouses and churches. One of their first stops is the Watershed Cafe. Mater Plan will not debut until the end of 2009, but Marvin & Gentry plan to play some of the songs from the album during their coffeehouse tour, and have already released songs digitally on their Web site, www.marvinandgentry.com. The Watershed Cafe is located in the Trolley Barn at 11 Whte Street, Frankfort. The concert is at 7:30 p.m. on Saturday, March 21. Great Story-Telling, and Terrific Harmonies Not unlike the 60/70s duos Simon and Garfunkel and Seals & Crofts, Marvin & Gentry blend poignant storytelling and textured harmonies to create a refreshing mix of music that at once soothes and inspires. "Dan Peek, too, made a return of sorts in 1994 when he helped produce the new group Peace, comprised of his old friends Ken Marvin and Brian Gentry, in Nashville, Tennessee. Unlike their 1989 collaboration, Light Of The World, Marvin and Gentry moved away from overtly Christian songs and instead focused on a mellow, soft-rock sound, admittedly heavily influenced by America. On the Peace album, which was entitled Stronger Than You Know, Dan co-wrote three songs, and contributed backing vocals, electric guitar, and harmonica. The record was commercially invisible, being released in limited, mail-order fashion on Dan's own Seven Mile Records, but he was pleased nonetheless. Brian Gentry and Ken Marvin who comprise Peace remind me very much of Dewey and Gerry when we first met... I have high hopes for Peace. In fact, Seven Mile Records is my own label put together specifically for the band. I have even toyed with the idea of joining them. That's how much I enjoy their stuff. For the moment, however, I am content to work behind the scenes. Additionally, I continue to write and record my own things. In fact, I feel like an "artist" again." A hard act to follow... Dan Peek & Peace turned out two more wonderfully crafted albums, the self-titled PEACE, and the critically acclaimed Under The Mercy. *MARVIN & GENTRY/ MILK 'N HONEY RECORDS (SPRING ARBOR) "Crosby, Stills, Nash fans take heart! Simon & Garfunkel devotees, there's hope! As unbelievable as it may seem, here in the late 1980's you can still find the sweet, harmonious, melodic music that we "over-30" folks thrived on back in the late 60's and early 70's. Safe Harbour bears an uncanny resemblance to the musical styles popular 20 years ago, but such timeless music should appeal to listeners of all ages. I'm surprised that the duo of Ken Marvin and Brian Gentry wasn't discovered earlier. Marvin & Gentry are talented songwriters and performers, and I expect that we'll be hearing more from them in the months and years ahead." M.B. We had Brian Gentry come to perform at our house concert on May 1, 2010. It is impossible to put into words to describe the experience. from those who were in attendance what an amazing talent Brian is. would have Brian back again in, as they say, a heartbeat. We hosted Brian Gentry at our coffee house ministry (The Upper Room) in Southern California. All I can say is "WOW". It was an "out of the park grand-slam concert". Never have I received so many 'day-after' emails and texts from our guests saying how much they enjoyed Brian. Many of them said they can't wait to have Brian return because they want to bring friends. Not only is Brian a tremendously gifted singer, songwriter and musician. It's his ability to weave his life's experiences and personal testimony into his concert that makes it all the more special. He has the ability to speak to a crowd as if he's speaking to you one-on-one. His unique charm and humility instantaneously warms the hearts of the audience and draws them in. Brian's vocals are crisp and clean with acoustic guitar that equals. We're already talking with Brian about a return to the Upper Room. The only problem is... I don't know if we can wait unitl next year. If you're thinking of booking Brian don't wait too long... I have a hunch that his calendar is going to fill up quickly as word of his DIRT FOR A CROWN album gets around. If you are familiar with the words and music of Marvin and Gentry, then you'll greatly enjoy this new one, Dirt for a Crown, a solo release from Brian Gentry. While all songs are written by Brian, many of the songs are laced with the familiar backup vocals of Ken Marvin who also produces. This is Brian's best work to date which says alot because his past recordings have been some of the best of its type to come out of Nashville. In the acoustic singer/songwriting tradition, Dirt for a Crown goes to heights previously not reached. There is an element of familiarity but, then again, complete newness with each song. A refreshing and impressive work. When I listen to this CD, I think "America" in the early days doing Positive songs. Yes and Dan Peek From "America" performs on one Song "On Wings Of Eagles",which is my favorate Song on the CD. Although "Turn Turn Turn" is great as well. If you enjoy acoustic driven songs then you will enjoy this CD. Their best CD!, November 17, 2006 By A Fan (VA) - See all my reviews This is their 3rd and IMO best CD. Their style is similar to many of the acoustic-based folk-rock groups of the 60's and 70's. It includes a nice cover of the Byrd's classic "Turn, Turn, Turn", and former America member Dan Peek contributes "On Wings Of Eagles". But my favorite is "Dance". A very strong CD! Excellent CD!, November 14, 2003 By A Fan (VA) - See all my reviews This is an excellent CD. 8 of the 13 songs are by former America band member and CCM artist Dan Peek. All the songs on here are good, the only draw back is that Dan's voice isn't as strong as it should be on some of his songs. Many of the songs have a harder edge to them, though there is plenty of acoustic based songs too. Best songs include Revolving Door, Windfall, Ocean Rolls, and Sweet Temptation. A very good CD! Most Helpful Customer Reviews 5 of 5 people found the following review helpful: Very good acoustic sound , November 14, 2003 By A Fan (VA) - See all my reviews A solid album by Marvin and Gentry. Very good folk-rock, produced by former America member and CCM artist Dan Peek. If you like acoustic guitar music, you will probably like this.